Tropospheric Scatter (also known as Tropo or Troposcatter.) was the method of communication chosen for the Pinetree Line radar stations which formed the 64th Air Division in the northeastern part of Canada during the 1950s and the early 1960s. This was the same type of communication system which was being used on the Dew Line at that time. We must remember that this was long before the days of satellites and other telecommunications systems which we take for granted in this day and age. Troposcatter relied on relatively high-powered transmitters and large high-gain "billboard antennas" to "bounce" signals off of particles in the troposphere which is the lowest layer of the atmosphere. Depending on the power used, and the antenna sizes, a single tropospheric "hop" can span several hundred miles, which would require several repeaters, if ordinary microwave systems had been used. Because the equipment used vacuum-tube technology, maintenance was a constant problem. While the radios were fairly reliable, they were difficult to maintain to the manufacturer's specifications for any length of time, and many thousands of hours were expended "tweaking" them back into specifications. The quality of troposcatter communications depended upon many factors and could vary from one hour to the next. Circuits were frequently logged out, especially during the winter, due to high noise levels. This was before the days of high-speed data transmission but even the simplest teletype circuit would not function and, at times, it was difficult to even have a telephone conversation. Matters slowly began to improve, with the implementation of new maintenance procedures that, in many cases, far exceeded what was called for by either the manufacturer or the Air Force. Here is a simplified explanation of Tropospheric Scatter. The typical military Troposcatter site used Frequency Division Multiplex (FDM) to combine a number of "circuits", which could be telephone, teletype or data lines, into one "baseband" signal, which is then applied to the modulator for conversion to an intermediate frequency (IF.) The IF signal then went to the "up-converter" where it was amplified and converted to the final radio frequency (RF) that was used for transmission. This was typically between 600-1000 MHz but higher frequencies were also used. Finally, the signal from the up-converter was applied to the power amplifier, where it was amplified to the desired power level. At each site, radio frequency (RF) energy from the transmitter was conducted to the feedhorn, via a waveguide, a form of transmission line designed for low loss. The feedhorn directed the energy towards the reflector. 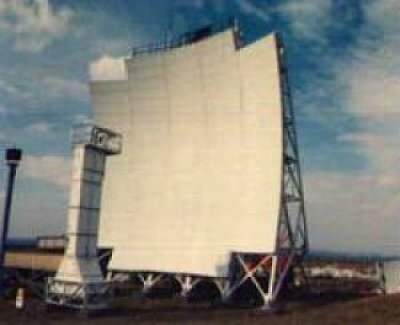 In the 64th Air Division case, the reflector was a concave "billboard" but the shape was only for practical reasons, the effect was the same as the "dish" type antennas seen on satellite systems. The reflector focused the RF energy into a fairly tight "beam" which was pointed at the "common volume". The common volume was the area of the troposphere, up to about six miles above earth, where the beams from both sites, which had spread to cover a much larger area, converged. Within the common volume, much of the RF energy passed through, into space, but enough of it is scattered back to earth to provide a useful signal strength at the distant site. At the receiving site, the small amount of signal received from the transmitting site was directed by the reflector to the feedhorn, down the waveguide, through a filtering network and into the down-converter, where it was amplified and converted back to the IF frequency. It was then amplified again by the IF amplifier, before being converted, in the demodulator, back to the baseband frequency. Finally, it was routed to the multiplex to be broken up into individual circuits, again. The photos which we have on our web site for Saglek have not been examined for the purpose of identification because of the fact that the shots are all distant in nature. It appears that Saglek made use of the three types of Troposcatter antennae at Resolution Island and these have been identified as the 60 foot, and perhaps even the 120 foot billboard antennae for their communications. As a rule, a radar station such as the one in Saglek would have had two pairs of Troposcatter antennae. There would have been a transmitter and a receiver antenna in each pair, and in Saglek, it is safe to assume that one pair faced north towards Resolution Island, while the other pair would have faced south towards Hopedale, thereby ensuring communications in both directions.